This posting is adapted from an article which originally appeared in the magazine Silver. Reprinted with permission. 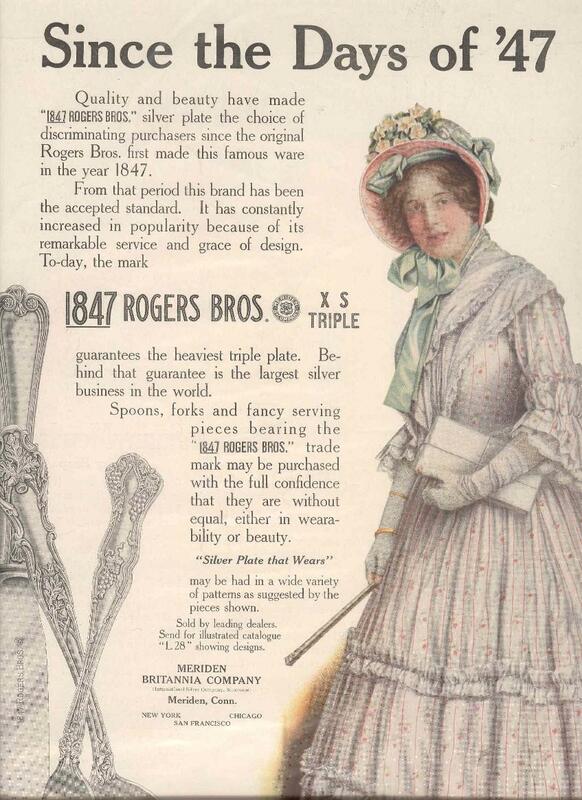 The International Silver Company used the 1847 Girl – both live and pictorial – to promote the history and quality of its 1847 Rogers Bros. line of silverplate. 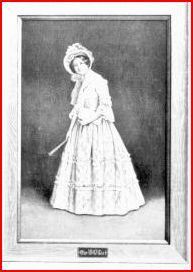 If you have looked at the picturesque advertisements from the early years of this century, you may have seen the 1847 Girl, the demurely clad maiden who was featured in ads for the 1847 Rogers Bros. line of silver plate. I met the 1847 Girl numerous times before I realized that she had two embodiments. The first was just part of a girl: the head and shoulders of a serene woman in a bonnet, personifying the International Silver Co.’s link back to the first days of silver plate in this country. 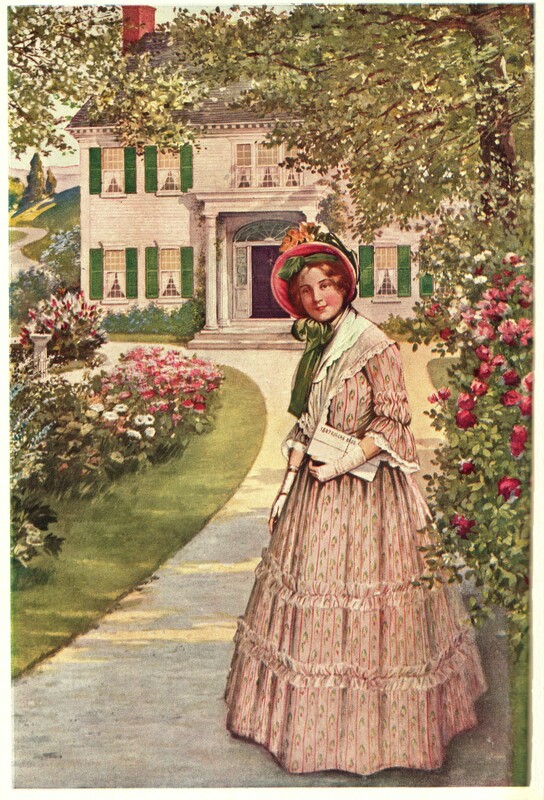 The second embodiment was more impressive: an attractive young woman in an early nineteenth century dress with a modest fichu, and still wearing the bonnet, posed in a number of scenes from the 1840s. Earl Chapin May in his Century of Silver (Robert M. McBride & Company, 1947) tells the story of the 1847 Girl and how she came to have two forms. 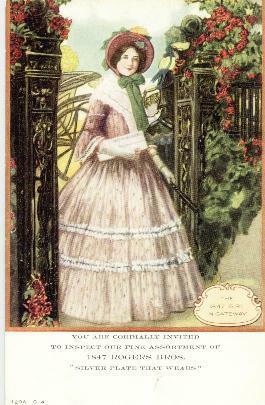 According to May, International started using the head and shoulders, usually in an oval frame, of the 1847 Girl in 1899 and continued to do so for many years. (I have found ads as late as 1912 with this motif.) William G. Snow, International’s advertising manager, developed the concept into a complete woman who could appear in advertisements – and also in jewelry stores. She began to appear in both black-and-white and color advertisements. In 1912, Miss Stella Brooks of Meriden was costumed as the 1847 Girl and sent to various jewelry stores to pose in the window and attract customers. According to her obituary in 1967 (The Morning Record, Meriden, Connecticut): “She was chosen, Mr. Snow explained, because she had a slight resemblance to the Mona Lisa in her smile, and a suggestion of a ‘come hither look in her glance.” In this obituary, fifty-eight years after the original promotion, the picture shown of Stella Brooks [Milroy] is the portrait of the 1847 Girl which today belongs to the Meriden Historical Society and hangs in the Andrews Homestead in Meriden, Connecticut. Times change and attitudes change. By 1947, when International celebrated 100 successful years of the 1847 Rogers Bros. line, the “come hither” glance that had engaged Mr. Snow apparently was not enough for the advertising agency of the times. A 1947 ad – headed “A social success in 1847 / A social success in 1947” – shows a new 1847 Girl, still smiling slightly, but with full red lips. 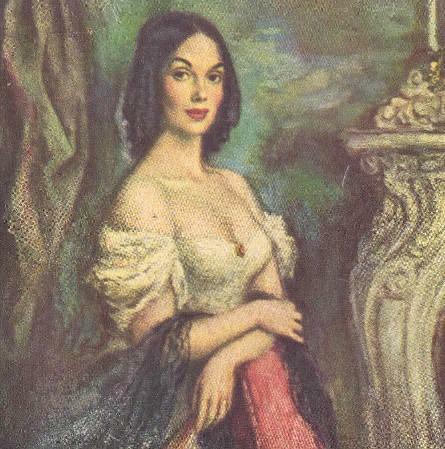 Her fichu is gone and her shoulders and breasts are exposed by an elaborate décolleté gown. Here is another image of The 1847 Girl which was not included in the original article. It appeared in an International Silver advertising publication called The Silver Standard. Most of my information came from the Meriden Historical Society. I have now added to the page here another picture of the 1847 Girl, one that I did not have when I wrote the original article. I am related to the 1847 girl..
Wonderfull. I hope my article has been fair to her. I think you did a wonderful job on this and wanted to thank you for it. Your site has really caught my eye! I’m subscribing!